Welcome to Coffee News® of the Foothills of North Carolina! Coffee News® is the most widely distributed restaurant publication in the world and has been hugely successful in helping small and medium sized businesses nationwide create a strong presence in their community for over 29 years, we are the “good news” publication all over the Foothills of North Carolina. Eager readers in our local communities are well served by our fun, weekly publication. You can find copies of Coffee News® of the Foothills, North Carolina editions in Rutherfordton, Spindale, Forest City, Ellenboro, and Caroleen, Shelby, Boiling Springs, and Light Oak,North Carolina. Local print advertising to local readers! 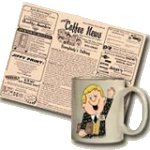 Fresh weekly issues of Coffee News® of the Foothills, can be found in locations throughout the local community. You will enjoy this free, fun, weekly publication in local restaurants, coffee shops, hair salons, professional offices, community buildings and other local businesses where people have a few minutes to read good news and fun features while waiting. Our goal is to be “everywhere” within the community to maximize enjoyment for our readers and exposure for our local advertisers. Everything in Coffee News® of the Foothills, NC is positive and entertaining, including unusual news stories, jokes, trivia, amazing facts, and horoscopes. Be sure to look for the What’s Happening section which is dedicated to listing local events taking place throughout our community. Have an non-profit local event to announce? Submit it here for possible inclusion in one of our upcoming editions (when space permits).